Skinny dip falls soap is skinny dippin in the falls. This is a real place in the Pisgah forest although its not really intended to be clothing optional unless your really brave because the water is freezing! This soap is made with stinging nettle found nearby. This stinging plant that nature gave us has incredible health benefits to the skin and hair. Savior Salve. this salve is made from jewelweed, Solomon's plume, nettle, and goldenrod. These herbs have antiseptic and astringent properties. They have been used for thousands of years to treat wounds, burns, insect bites, poison ivy, eczema and other skin conditions. The Herbs are then infused in sweet almond oil over several hours. After the oil is strained and beeswax is added it is gently poured into tins. After the liquid becomes hard it is ready for use. 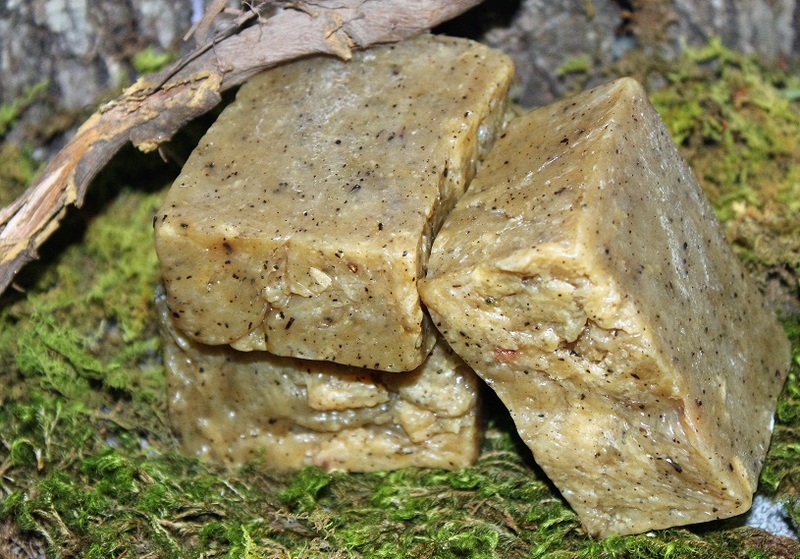 A Hint of Vanilla, Hazelnut, Clove and Cinnamon makes this an Awesome Winter Soap! If you haven't had the chance to check out this brewery then you must. It has a super atmosphere! Check out their calendar for many great events and music venues. Highland Cold Mountain Winter Ale Soap made from the beer of a local brewery. Black Balsam Salve made from the sap of a balsam fir tree. Highland Gaelic Soap is a soap scented with lemongrass, lavender, bergamont and tea tree. Combined with the hops and grains of this beer it is a moisturizing rejuvenating. Soap. We call this soap Buck Springs. We take burdock and dandelion root which has been infused in olive oil and mix it into the soap just before we put the soap into the molds. Burdock root is known to be effective for dry, itchy, irritated skin. Dandelion rot has been knwn to remove toxins, reduce inflammation, treat age spots and other skin blemishes and to fight acne.